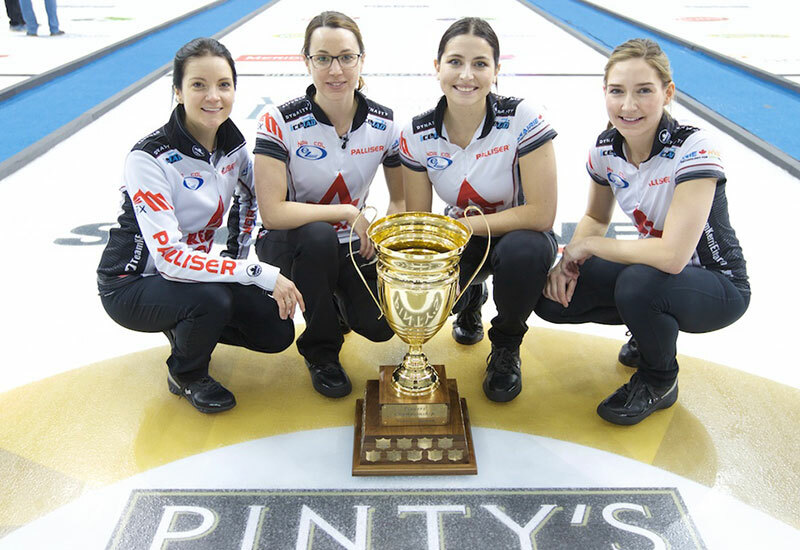 Kerri Einarson (Winnipeg, Manitoba) wins the Players' Championship, defeating Anna Hasselborg (Sundbyberg, Sweden) 5-4 in an extra end in Toronto, Ontario at the Mattamy Athletic Centre in Maple Leaf Gardens. Einarson with Val Sweeting at third, Shannon Birchard and Briane Meilleur on the front end take home the $30,000CDN first place cheque along with 84.279 world ranking points, while Hasselborg receives $24,000CDN and 61.805 world ranking points for their second place finish. After a first end blank, Einarson stole 1 in the second end when Hasselborg failed to roll in for shot on a hit, Hasselborg responded in the third end with a hit to score 2. Einarson scored a single in the fourth end to tie the game at 2, then forced Hasselborg to a single in the fifth end. Einarson scored 2 in the sixth end after splitting the rings. After a blank end, Hasselborg was held to a single point in the eighth end sending the game to an extra end where Einarson made a brilliant hit and roll with her first shot that scored the winning point. In the semifinals, Einarson defeated Robyn Silvernagle (North Battleford, Saskatchewan) 7-4 and Hasselborg defeated Casey Scheidegger (Lethbridge, Alberta) 5-4 in an extra end. Scheidegger and Silvernagle earned $16,000CDN and 47.758 ranking points for their semifinal finishes. In the quarterfinals, Einarson defeated Tracy Fleury (East St. Paul, Manitoba) 6-4, Hasselborg defeated Satsuki Fujisawa (Kitami, Japan) 5-4, while Scheidegger defeated Jennifer Jones (Winnipeg, Manitoba) 6-5 and Silvernagle defeated Chelsea Carey (Edmonton, Alberta) 5-4. Fleury, Jones, Fujisawa and Carey earned $12,000CDN along with 33.712 ranking points for their quarterfinal finishes. Einarson went 2-3 in the 12 team round robin pools qualifying round. In their opening game, Einarson defeated Fujisawa 6-4, losing their next game to Hasselborg 5-2. Einarson lost to Carey 6-4, then dropping another to Sayaka Yoshimura (Sapporo, Japan) 5-4 to drop to 1-3. Einarson responded with a 7-2 win over Scheidegger, starting a 4-game winning streak en-route to their title win.